An editor has been promoted following the purchase of his weekly newspaper by a regional publisher. Newsquest has announced that Alan Marriott, who edits the Isle of Wight County Press, will now have the title of publisher at the paper. Newsquest completed the buyout of the County Press in July after shareholders voted unanimously in favour of the move, despite calls by an island businessman, its MP and the National Union of Journalists for the deal to be delayed to allow an alternative local bid to be presented. 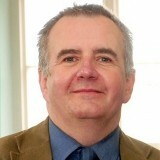 Alan, pictured, celebrated 10 years as editor in April this year. Alan began his career as a trainee reporter at the Chester Observer in 1980, moving to the Isle of Wight in 1984 to become sports editor at the County Press. He held a number of editorial production roles there prior to his appointment as editor in 2007. In his new position, Alan will report to Newsquest Hampshire managing director Vincent Boni. Vincent said: “I am delighted to see Alan step up to this important role. Let’s all hope Newsquest doesn’t “maim” one of the most thorough and oldest papers in the UK, with staff cuts etc. leading to reduced decent coverage of the Isle of Wight. Newsquest doesn’t have a good record in recent years, say many. Alan has been there for a longish time and must hope he will not see damage inflicted around him. Thoroughly old fashioned paper, in the most positive sense. Let it be.